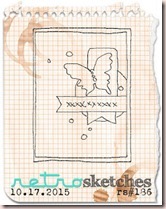 I am so in love with last month’s Simon Says Stamp kit, I have to play with it again before the next one shows up. 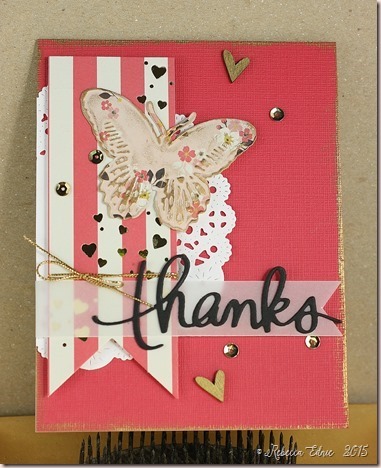 Now i have to start by saying that the hearts cut from the striped paper are not black. They are backed with gold mirrored paper. You can see it a bit through the vellum just under the bow. The other gold is gilder’s paste which I used on the edges of the card front and on the raised edges of the embossed butterfly. The striped panel is raised with fun foam. But then when I went to add the banner and ‘thanks’, I was a bit stuck on how to raise it up to match the striped panel’s height. I ended up using white fun foam cut with the word die and carefully placed behind word die cut. It works quite well!